Aspose.Email for Android via Xamarin is a set of email APIs for android apps developed using Xamarin framework. Android developers can easily utilize API to read and extract Outlook PST file that can be saved to disk in MSG format. Aspose.Email for Android via Xamarin API empowers developers to manage Personal Storage Files (PST), Offline Storage Files (OST) along with message sending and receiving capabilities. Email messaging API gives complete control over an email message like changing message contents, manipulating (adding, extracting and removing) attachments from a message object as it provides access to message Mapi properties. Through its iCalendar API, Aspose.Email provides you the capability to create and save Outlook Calendar objects in various formats such as MSG and ICS. Not only you can create and save these, but you can send, retrieve, update and cancel meeting requests through message sending protocols mentioned earlier. When it comes to sending/retrieving emails, Aspose.Email API empowers you to create, send and receive emails using SMTP, POP3 and IMAP protocols. It allows you to log into POP3 servers by username and password or APOP authentication to perform email operations like: view mailbox size and messages count, retrieve the full message or its header, delete messages from server as well as basic POP3 commands. Aspose.Email for Android via Xamarin supports IMAP protocol including authentication, create, delete, select, query folders, get, delete and save messages, change message flags and basic IMAP commands. 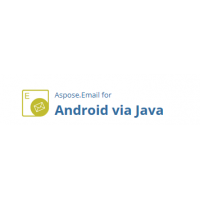 Aspose.Email for Android via Xamarin supports accessing emails from Microsoft Exchange Servers. You can list messages from a folder, for example inbox, drafts, download messages and save them as EML, MSG or MHT format. Emails and meeting invitations can also be sent using the Exchange Server. Both WebDav and Exchange Web Services (for Exchange Server 2007 or later) can be used to connect to the Exchange Server. The Email API also supports Unified Messaging operations available in Exchange Web Service (EWS). With Aspose.Email for Android via Xamarin you can easily and reliably calculate occurrence dates and times for even the most complex recurrence patterns. Also consume and produce recurrence patterns in the iCalendar (RFC 2445) format and create recurrence patterns programmatically via an intuitive object model. Aspose.Email for Android via Xamarin further allows you to use yearly, monthly, weekly, daily, hourly, minutely and secondly recurrence patterns, and represent recurrence patterns in your windows, web or mobile applications. The recurrence patterns implemented by Aspose.Email for Android via Xamarin are coherent with schedule related elements of the iCalendar RFC (2445).